After we ate this for dinner one night, there were a few people at our house for a meeting. My pastor was there and shortly after arriving he casually asked what we'd eaten for dinner that night. I briefly described this dish and we moved on. It wasn't until later that I realized he probably wasn't asking in a 'curious because she's a food blogger' way, but in a 'your house reeks, what were you cooking?' way. I've talked before about how our house has the tendency to retain cooking smells. That night I'm sure the smell of previously roasted brussels sprouts was permeating the area. Aren't you just dying to come to my house now?! 1. In a medium sized saucepan, add 1 cup barley and 2 1/2 cups water. Over medium heat, bring to a simmer and simmer for 30-40 minutes until liquid has disappeared. Remove from heat, fluff with a fork, and set aside. 2. Toss brussels sprouts with olive oil and salt in a medium-sized bowl. Heat a cast iron skillet over medium-high heat on the stove, for 2 minutes. Add brussels sprouts to hot skillet (rearrange so that flat sides are down). Allow them to cook for 2 minutes. 3. 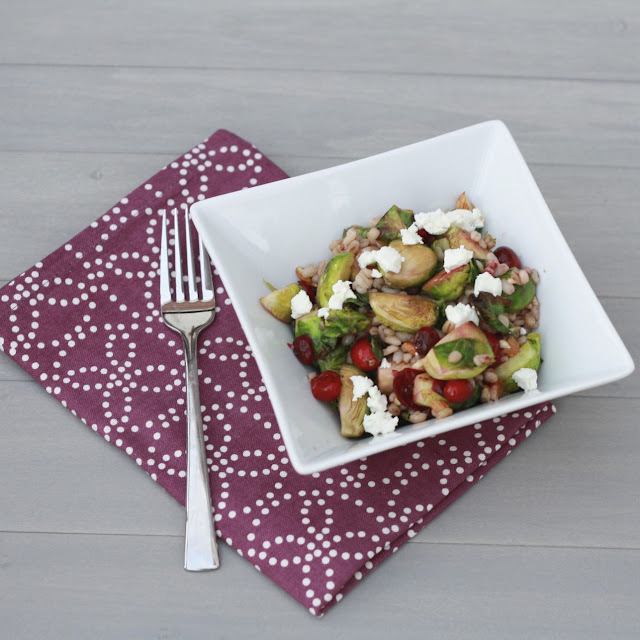 Toss the fresh cranberries into the pan and transfer the pan to your broiler (if you don't have a cast iron skillet, use a frying pan for the brussels and transfer them plus the cranberries to an oven-safe baking dish). Broil the brussels sprouts for about 3 minutes, until browned and slightly caramelized. Cranberries should begin to pop. 4. 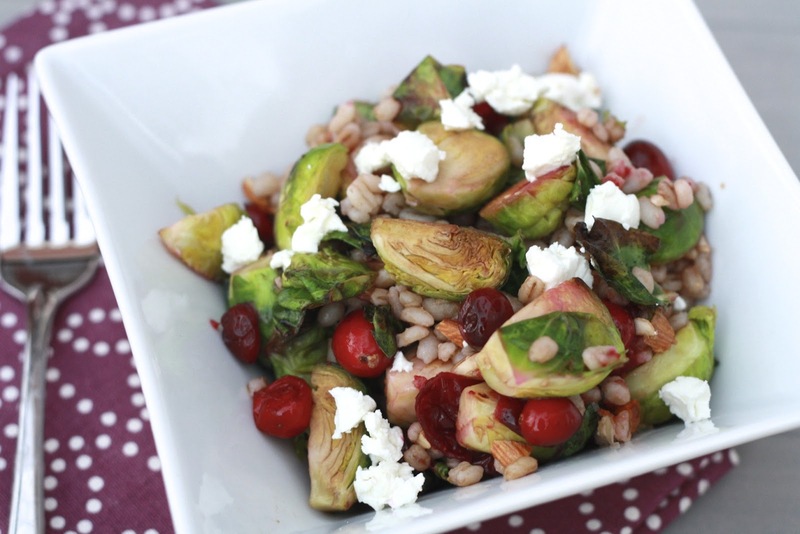 Toss barley with sprouts, cranberries, goat cheese, and almonds in a bowl. Drizzle with balsamic and maple syrup. Season with salt and serve immediately.